A compilation of some of the best Google+ “Getting Started” guides, tools, and tips for users new to Google+. If you’re new to Google+ and wondering how to get around have no fear, the newest social network on the block is filled with a vibrant user base that is willing to help. A great deal of content has been created and shared among Google+ users. This list by no means captures ALL of that content (it originally started as a post I made on Google+ itself); it should however, provide a list of resources to help you get going. +Natalie Villalobos, Community Manager for the Google+ project, suggests starting with Early Adopter’s Guide & The Starter Pack by+Ahmed Zeeshan. Both are excellent resources for getting started on Google+. +Ardith Goodwin has created a group of users who have volunteered to help users connect with existing users of Google+ who are willing to help people new to Google+ should they want/need one-on-one help. The members of this group can be found on the Group/As site. The members of the group will frequently post “New To Google? Let Us Help!” posts letting new users know we’re here if they need assistance. 1) The first is by simply adding my NewToPlusTeam Circle to your Circles. 2) If you use Chrome as your web browser you can also utilize the Circle+ Chrome extension by +Daniel Treadwell. 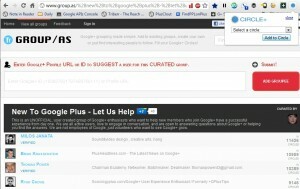 Once this extension is installed and activated you will see a blue circle on your toolbar. This will allow you to add the entire “New To Google? Let Us Help!” team into your Circles with one click. Log on to Google+ and go to your Circles tab at the top. The very first circle on the far left will say “Drop contacts here to create a new circle”. 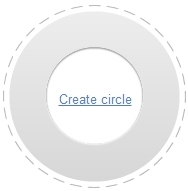 If you place your mouse over this Circle and the text will change to “Create Circle”, click to create a new Circle. A dialog will appear asking you to name your Circle, provide a description, and add users. You can name it anything you’d like, and the description is optional. Name the Circle “NewToPlusTeam” (or whatever you’d like), add a description if you want to, and then click the blue “Create an empty Circle” button. Now visit the Unofficial New To Google+? Team page listed above and click the blue Circle+ button on the top right hand side of your browser. Choose the “NewToPlusTeam” Circle from the dropdown, and in one click you will be able to add all of the members to your Circles. There is more than one page of users. If you want all of us in there just click to the next page and repeat this step. You’re done! You’ll now see incoming posts from the team providing tips, hints, and suggestions. Feel free to interact with the “New To Google? Let Us Help!” and let us know if we can help.